understand these changes, therefore, it is important to make this transition as easy as possible to avoid suffering and rejection. While still in the hospital, clean clothes should be brought into direct contact with the baby. Take those clothes home, and place them in area where your dog likes to spend time, such as under a feeding bowl, next to its toys, or near a sleeping mat. Dogs have a keen sense of smell, and contact with the cloths will begin to familiarise your dog with the smell of the baby and relate that smell with pleasurable activities like eating, playing and sleeping. tranquility of the dog. Also avoid abrupt changes in the animal’s routine. Walks and play time should continue at the same intensity as before the arrival of the baby, to avoid anxiety and destructive or unwanted behaviour. be supervised to avoid accidents! 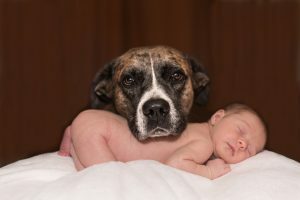 One Response to "Dogs & babies"
Excellent article! My friends recently went through the dog adoption process with the newborn. They did some of the things you wrote here but most of the people simply don’t know what to do. It is important to make such atmosphere in the house which will not bring the dog down but to include him with the baby activities. That way the new child will get to form a bond with the dog which will create the best of friends!